Avtek Solutions has successfully become Approved Installers of the Aquarian Gebrik Insulating Brick Cladding System as it looks to continue its ambitious growth plans across a range of sectors. 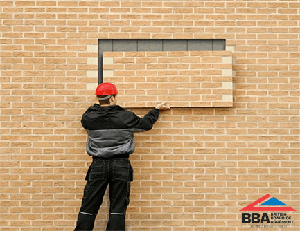 Brick Cladding has transformed the construction industry with a solution which achieves a finish that looks and weathers as conventional brickwork but dramatically reduces installation times. The Aquarian Gebrik Insulating Brick Cladding solution has firmly established itself as one of the market leaders with an extensive range of brick finishes and a customer service which is second to none. To achieve the Approved Installer Status, Avtek Solutions has not only had its installers tested to demonstrate they have the necessary skills, knowledge and experience to carry out the installation of the Gebrik Brick Cladding solution, but the project management team have also been fully tested to ensure they can deal with every situation. This Approved Installer status ensures that any Gebrik Brick Cladding installation work carried out by Avtek Solutions will be covered by the manufacturer’s 10-year insurance-backed Product Warranty.